PoPville » Dear PoP – Has weekend yellow line service in the direction of Huntington been suspended north of Mount Vernon Square? Over the last several months, I have made an observation that I can’t seem to make sense of, and I was hoping that you could clear up my confusion. I live in Columbia Heights, but occasionally travel to Alexandria on the weekend. 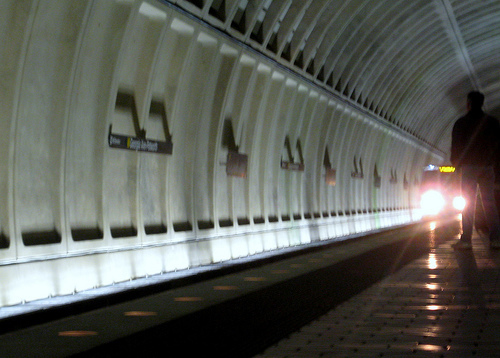 This is an easy enough trip– hop on the yellow line at Columbia Heights in the direction of Huntington. However, for the last several months, I have noticed that there are no yellow line trains at the Columbia Heights (or U Street) stations in the direction of Huntington on the weekend. The board in the station only displays anticipated arrivals for green line trains, and simply waiting for a yellow line train has proved a failure. Instead of boarding a single train, I am forced to transfer at Chinatown (or Mt Vernon Sq) with standard weekend wait times between trains. Despite this lack of service, trip planner on the WMATA website continues to list departure times for yellow line trains from Columbia Heights toward Huntington and no relevant service disruptions are present on the website. Moreover, there still appear to be yellow line trains traveling in the direction of Fort Totten, so the suspended service is only heading out of the city into Virginia. I don’t do this weekend trip very frequently, but my experience has been consistent. I know I’ve still been able to catch the yellow line over the weekends – have others noticed any changes in the yellow line over the weekend. I know it’s possible in the future that it could get cut/reduced in budget cuts but to my knowledge that has not yet occurred (and hopefully never will! ).